ALC in service with Michael Matos. Aquinas Literacy Center (ALC) is celebrating its 20th Anniversary during the 2016-2017 academic year. ALC was founded in 1996 by the Adrian Dominican Sisters in response to the needs of immigrants in the McKinley Park neighborhood and surrounding areas to learn English. ALC continues to offer free, individualized tutoring in the English language to adult immigrants. In preparation for the school year, ALC held a training workshop for new tutors on August 26 and 27. Three current tutors came to share their experiences and tips they had on tutoring adult immigrants. The next new tutor training will be held on October 21 and 22. 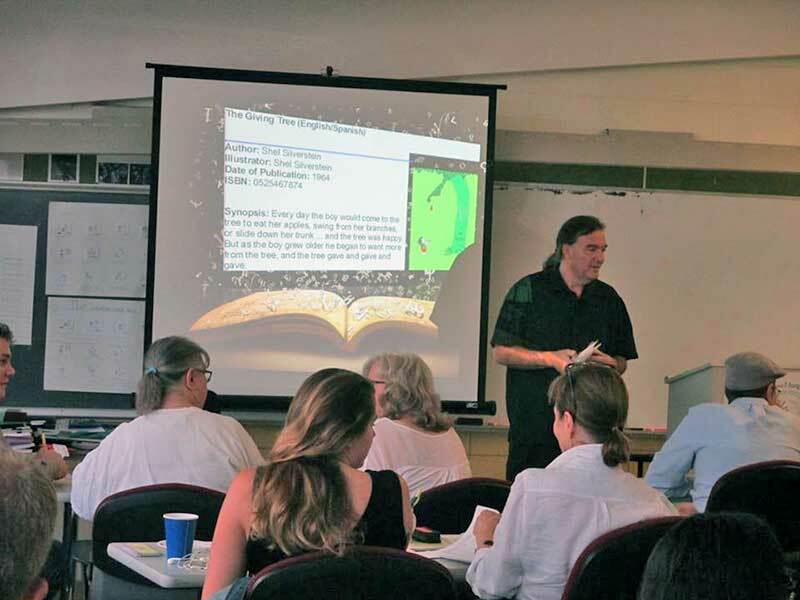 Last week ALC also offered two professional development sessions for returning tutors. Seasoned literacy professional Michael Matos of Albany Park Community Center and Literacy Works taught both sessions. Matos gave an overview of how adults learn a new language, and he led participants through hands-on activities designed to help them meet the various learning styles and stages of language acquisition for ALC learners. 74 current tutors attended the sessions, the highest attendance to date for an ALC in-service. On the first day of classes, September 6, ALC registered 11new students for its one-on-one English as a Second Language (ESL) tutoring program. All registered students are additionally able to take advantage of ALC’s small group classes, such as Beginning Conversation, Verbs 101, and Book Club. ALC’s Computer Learning Center (CLC), a drop-in computer lab, is also available to registered students during open hours. Students can use the CLC to learn English at their own pace through the computer program Rosetta Stone. Registration is open during regular ALC hours to adults who are beginning English language learners. ALC is open Monday through Wednesday from 9am to 8pm and Thursdays from 9am to 5pm. Students must register in person. In light of ALC’s 20th Anniversary, students are spending their first class of the new school year thinking, writing, and drawing about the prompt “What does Aquinas Literacy Center mean to me and to the community?” Their responses will be on display at ALC throughout the school year. ALC’s first week of classes will end on September 8, which is International Literacy Day. Proclaimed by UNESCO in 1965, International Literacy Day continues to highlight the importance of literacy for the individual, for communities, and for society as a whole. In honor of International Literacy Day, ALC will be giving away free children’s books for its adult learners to read with their young children or grandchildren. For more information or to volunteer at Aquinas Literacy Center, call (773) 927-0512 or email info@aquinasliteracycenter.org.